All crowns are designed to restore functionality to a damaged tooth. But crowns can differ from one another in their appearance, in the material they’re made from, and how they blend with other teeth. A crown is a metal or porcelain artifice that’s bonded permanently over a decayed or damaged tooth. 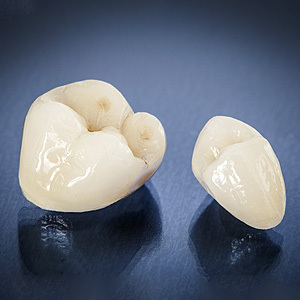 Every crown process begins with preparation of the tooth so the crown will fit over it. Afterward, we make an impression of the prepared tooth digitally or with an elastic material that most often is sent to a dental laboratory to create the new crown. It’s at this point where crown composition and design can diverge. Most of the first known crowns were made of metal (usually gold or silver), which is still a component in some crowns today. A few decades ago dental porcelain, a form of ceramic that could provide a tooth-like appearance, began to emerge as a crown material. The first types of porcelain could match a real tooth’s color or texture, but were brittle and didn’t hold up well to biting forces. Dentists developed a crown with a metal interior for strength and a fused outside layer of porcelain for appearance. This hybrid became the crown design of choice up until the last decade. It is being overtaken, though, by all-ceramic crowns made with new forms of more durable porcelain, some strengthened with a material known as Lucite. Today, only about 40% of crowns installed annually are the metal-porcelain hybrid, while all-porcelain crowns are growing in popularity. Of course, these newer porcelain crowns and the attention to the artistic detail they require are often more expensive than more traditional crowns. If you depend on dental insurance to help with your dental care costs, you may find your policy maximum benefit for these newer type crowns won’t cover the costs. If you want the most affordable price and are satisfied primarily with restored function, a basic crown is still a viable choice. If, however, you would like a crown that does the most for your smile, you may want to consider one with newer, stronger porcelain and made with greater artistic detail by the dental technician. In either case, the crown you receive will restore lost function and provide some degree of improvement to the appearance of a damaged tooth. If you would like more information on porcelain crown, please contact us or schedule an appointment for a consultation.